It's never too early to start teaching your little one health! And Alpha Omega Publications has exactly what you need to start off right—the Horizons Kindergarten Health Student Workbook! Perfect for young learners, this colorful, consumable workbook contains over 40 student visuals and drawing activities that directly correlate with lessons taught in the Horizons Kindergarten Health Teacher's Guide! These student activities are teacher-administered and help visually teach beginning health concepts—such as living in a family, getting along with others, taking care of the body, being safe, and preventing health problems. Hands-on activities, divided by unit and lesson, include coloring pictures, matching and identifying objects, cut outs, and letter tracing! But there's more! Perforated pages in Horizons Kindergarten Health Student Workbook allow for easy removal so that your child can easily complete health lessons and proudly display his finished work on the refrigerator. Best of all, the Horizons Health, designed to be taught two to three days per week, is very flexible and can be taught according to your young learner's schedule. Plus, this Christian-based curriculum can be integrated with other subjects or taught separately. Sound great? It is! But don't take our word for it. 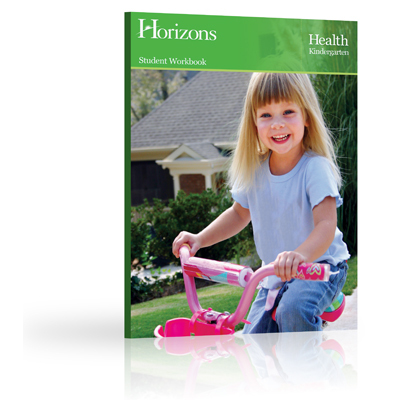 Order your Horizons Kindergarten Health Student Workbook today—and see how much fun homeschooling your kindergartener can be!